CAFE ALTURA ORGANIC FREEZE DRIED INSTANT COFFEE is an exclusively sourced blend of organically grown 100% Arabica Coffees selected from three continents. It is freeze dried by an exclusive certified organic process to maintain the taste and aroma of real coffee. All coffee is grown sustainably by indigenous growers who form the basis for Fair Trade exchange. We sell instant coffee in bulk! Read more at the bottom of the page. 3.5oz Organic Freeze Dried Instant Coffee has been added successfully to your wishlist. CAFE ALTURA ORGANIC FREEZE DRIED COFFEE is an exclusively sourced blend of organically grown 100% Arabica Coffees selected from three continents. It is freeze dried by an exclusive certified organic process to maintain the taste and aroma of real coffee. All coffee is grown sustainably by indigenous growers who form the basis for Fair Trade exchange. INSTRUCTIONS: Use 1-2 teaspoons per cup. Add hot water and stir. Add dairy and sweetener to taste. Makes 60 servings per jar. Bulk sizes are available. Food Safety and Compliance documentation for food processors is provided including: COAs for each lot, HACCP, Third Party Audits and more. Please contact us for Product Specifications and more information. I personally dont usually like instant coffee, but this has a really good taste to it. I have purchased this brand of ground coffee before and it was good too. Husband agrees this coffee tastes great. The holy grail for people who drink instant coffee is for one that has the aroma and taste of brewed coffee. This is one of the better instants I've tried but its still not as good as a brewed coffee. I am willing to pay a little more for a company that cares about its impacts on the world. High quality beans with a social conscience is worth a little extra. I think it shines the best for baking. Highly recommended. Organic, Fair Trade, freeze-dried, decent flavor. This is a great thing to keep handy for emergencies. My family doesn't drink much instant coffee but sometimes ill make it early in the morning before I get going. Delicious. Seems more concentrated than others. The Fair Trade part is bonus. My daily coffee is Cafe Alturas whole bean Ethiopian.When Im away from home this does the job just fine.Puts other instant coffees to shame. Recomended. I like the taste of this coffee. Its definitely in a different category than Folgers and the like. Its still a good value for a cup of coffee at around 20 cents but when you can get a pound of the okay stuff for ten bucks, you need to really appreciate everything else about the product besides just the coffee. Fair Trade, Organic, etc. This coffee is really a lifesaver for someone always on the go or with very little time to themselves. I take care of little one at home and I demand the highest quality from what I buy, especially coffee. I like it black and Ive tried this cold and its tasty that way too. Its smooth and quick and a must for the days that I dont even get a minute to relax. I must also confess that even when I do find time to break out my pour over gear Ive gone to this more than once. Seems more concentrated than others. The Fair Trade part is notable. Not as good as the beans I buy locally but for what it is I like it. This coffee is the next best thing to the freshly roasted, freshly ground coffee we use. Before when I was lazy and didnt want to go through that hole process I used Nestles Gold which is among the best. Cafe Altura's instant is just a bit better and also organic. The convenience and taste are perfect. I also discovered that I can use it to spike brewed coffee and make super coffee! Has good flavor and really enjoy! By far the best instant coffee I've ever had. 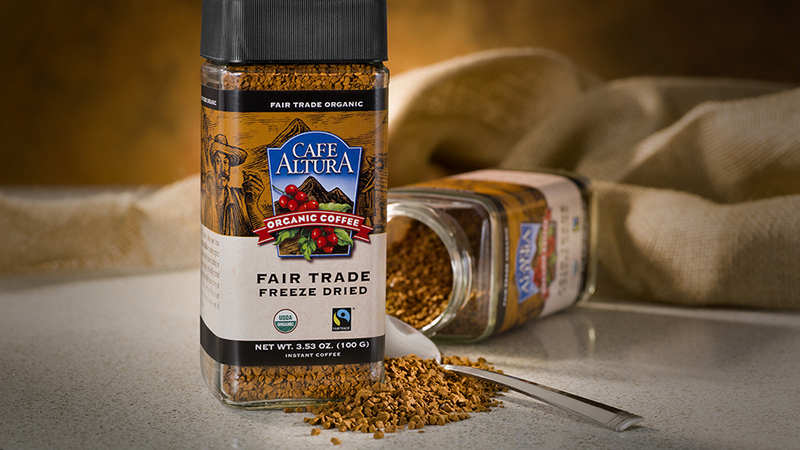 Organic, Fair Trade and non-gmo.. Ive been a fan of Cafe Altura for over 20 years and im never disappointed. If time is an issue and a quick cup is all you need this is perfect. Will repurchase. Excellent flavor! An instant coffee that surprises the pallet with flavor of freshly brewed. You can taste the pureness and quickly realize your taste buds are savoring organic coffee beans at its finest, yum! Satisfies!! Buy this coffee; this is the best regular coffee I have every tasted in my life , hands down. Yes, I know, it is instant, BUT it works. It sounds strange but I am willing to put my other guitar on it (yes I have one on the line to vouch for ALtura's organic instant decaf). I love my guitars. I discovered Atura's organic instant regular at a grocery store. I lived with drip machines, k-cups, presses, etc. for years, but I was sick of the cleanup and maintaining process with all the traditional methods to get a good cup of coffee. I wanted something quick and easy, so I went instant. The problem I found was I could not find anything that tasted like "real" coffee, let alone fit my organic lifestyle. One day last year at Earthfare, I found Altura's regular organic instant, so I spent the extra money (which to me is not a lot) and I was hooked. It tasked like actual coffee AND it's organic, instant, and I can get a nice lift off it :). The rest is history. I love it. Listen folks, this instant coffee tastes just like regular coffee!! My overall coffee experience is so complete I go to Starbucks just to get hot water in a cup and bring my own Altura Instant. The only thing I have to consider is the time of day...do I bring regular or decaf (if you have not tried the decaf version of this instant coffee, do so...it is amazing too)?! I suppose that is a good problem to have. To wrap up this review, try the instant organic coffee (and the decaf version if you have not already) and leave these folks at Altura a great review. I need you to because I want to drink this coffee for life. *Note Bene~ If you are on the fence, consider this your nudge...you can thank me later. Bit expensive but its good coffee. I grind my own beans every morning but we got a jar for free for ordering a lot and my wife likes it. Might not make the strongest cup but its not bitter or harsh and is very easy on my stomach. It might be organic or fair trade and all that but thats not enough for me to buy it when I can get something cheaper. If it was all I had I would probably drink it, though. I did like the jar. Not the best I have used. Tasted like water. I was excited to try it but I am disappointed.I tried adding more and more but it never tasted like coffee. I'm not sure why it gets so many good reviews. I called their 800 number and got a refund. I can say that their customer service is great, or at least the person I spoke to. He just asked for my order number and that was it. He said something about this product not having the flavor of really dark roasts and that its just different from what I expected. Plus one star for the service. The only Fair Trade organic instant coffee I could find. Like most of the others I tried...its.. not the best. Ill stick with their Sumatran Dark roast. Low Acid Coffee Sampler Pack View Sale!